Hello everyone! I have a real quick card to share tonight. I wanted to play along with Our Daily Bread designs Shining the Light Challenge this week, as we are celebrating THREE years of offering God's Word to the stamping community this week! So there is a special challenge with a special prize! The challenge is to use either leather, which is the traditional third year anniversary gift, OR pearls, which is the third year gem. Well... if you want to see some awesome samples, hop on over to the ODBD Blog and check them out! I decided to use pearls on this card. I wanted to use this great sentiment from the Eternity set, as is the frame, decorative element and the custom elegant oval die cut (By Spellbinders) that cuts this frame so beautifully. My card stock is Gina K Pure Ivory and Papertrey Aqu Mist, as is the ribbon. I used SEI chalk Ink, Prima flowers, MS punch, CB folder and the little butterflies are from the Our Daily Bread designs Happy Birthday set. Happy Anniversary Kelley and all of Our Daily Bread designs! Please come back on Thursday the 17th when we will have our special Anniversary release Blog Hop! There will be lots of chances to win wonderful prizes!!! Such a beautiful card. I adore the colour and the embossed pattern is so pretty. Thank your for linking up to Make It Monday this week. Gorgeous my friend. When I come here I always have an "exhale of amazement" moment when I first see your artwork. Every detail fits perfectly. Your creations are beautiful...a perfect reflection of your heart. Love you, sister! Amazing....so beautiful Grace! Love the colors, the embossing, everything about is gorgeous! Absolutely gorgeous Grace!! Thanks so much for sharing with us this week at Penny's. Good Luck!! This is gorgeous Grace! Love how you shaded the embossing. Love all the detail and that colour. Spectacular card. Thanks for joining us at Paper cupcakes this week. Wowe this is such a beautiful card!! The one below is also gorgeous! Tis beautiful. Love the embossing and the sentiment . Beautiful embossing and chalks, butterflies and ribbon! Thank you for joinin us at TCPF!!! Very pretty Grace, I love that new set and the die to match. This is beautiful Grace.. I love this embossing folder. Your colors are so pretty. Great job. It was so good to see you on Saturday. Let's do coffee in a few weeks. Your card is stunning! I love the colors and the embossing is perfect! Thanks for playing at Critter Sketch this week! 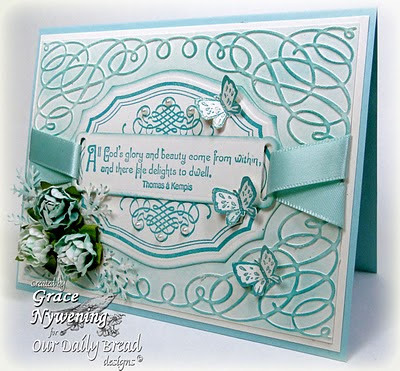 I love butterflies and the aqua color is so pretty on this card, just divine the way you put this together. Absolutely stunning, Grace! I love the monochromatic aqua and all the gorgeous details! I hope we can get together again sometime soon! Hugs! This is beautiful Grace!! Love the aqua color on this and the florals and butterflies...lovely design. Great colors, soft and beautiful. Your soft colour along with the embossing and verse makes for such a pretty card. Thanks for joining us at Let's Ink It Up embossing challenge. A beautiful card Grace, the colour is gorgeous and gives a very elegant feel to the card. Wonderful embossing and beautiful sentiment. Gorgeous card Grace. Love that enhanced embossing. Jaw dropping GORGEOUS Grace, Oh my word I Love your embossing, this is sooooooo BEAUTIFUL!!! WOW WOW WOW and the layout is PERFECT!! Very Pretty - love the embossing and the flowers! Thanks for joining our Pastel with Bling challenge over on the House of Gilli Challenge Blog! Wow girl!! This is so elegant and beautiful!! I just love all the texture and your colors. Beautiful frame you have created. Oh...thanks for supporting the ODBD Challenge yet again. You are the best!! What a gorgeous elegant card. Thanks for entering this in our Mami Doodle challenge. LOVE the monochromatic look to this! stunning per usual! A beautiful card. Love the embossed details and colours you have used. I love this card Grace, the buttreflies and flowers are a fabulous touch and the embossing really gives it additional dimension. Thanks for sharing them with us at Let's Ink It Up. Just so beautiful!! Love the design and the colours are just lovely!! A very classy and elegant card with beautiful embossing. Thank you for joining us again at Sentimental Sundays. Stunning to say the least Grace! I love the aqua color :) TFS! This is gorgeous, Grace! Thanks so much for joining us for a Mami Doodles challenge! Thanks for joining us at The Rubber Cafe for this weeks challenge to use your favorite dye! Love the detail in your card. Beautiful card. Thanks for joining the Card Cupids challenge. Beautiful card, so delicate! Many thanks for taking part in the Mami Doodles challenge. Your design and colors are fabulous Grace!!! Thanks for joining Let's Ink It Up's embossing challenge! Gorgeous card! I love all the swirls and details - beautiful! Thanks for joining us at Critter Sketch Challenges! A gorgeous card! Great use of the frame embossing folders and I love the extra inking. The butterflies are gorgeous! Thanks for playing with Paper Sundaes! Grace, this is just so gorgeous! I love the embossing, the Spellbinders die and your fabulous design. Thanks so much for joining us for this week's Critter Sketch Challenge, we hope you will come back and play again next week! fabulous card, Thanks for joining in with us at Stamp Fairy challenge this week. Lovely monochromatic Card ! Tks for joining us at the House of GILLI Pastel and Bling Challenge.